I will flesh this out better and more professionally later, but wanted to get it out there before someone else lays claim to the discovery. It is an "earth shaking" discovery, literally. 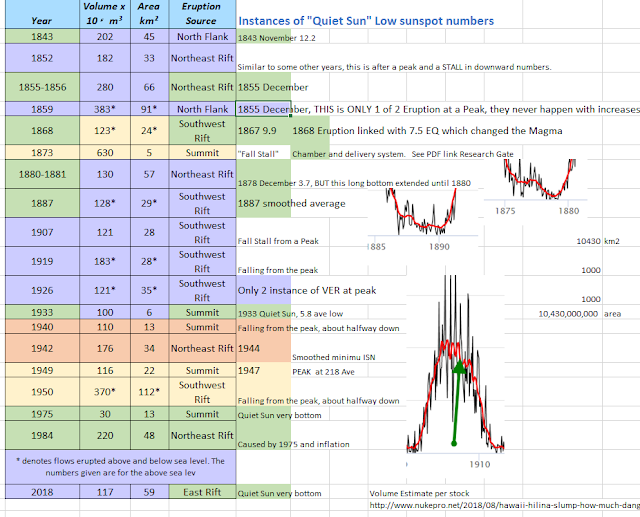 Using historical records of the Moana Loa Volcano going back to the early 1800's, and historical records of our Star's Sun Spot counts, it became very obvious that solar minimums, aka Quiet Sun, cause volcanic eruptions. 1) More than half of the big Eruptions were right on solar minimum. 3) If the Eruption did not happen on the minimum, then it will happen usually at 1/3 to 1/2 of the way "back down from the peak" and once in a while, right at the peak. Well this should flip the geophysics eggheads, on their heads. 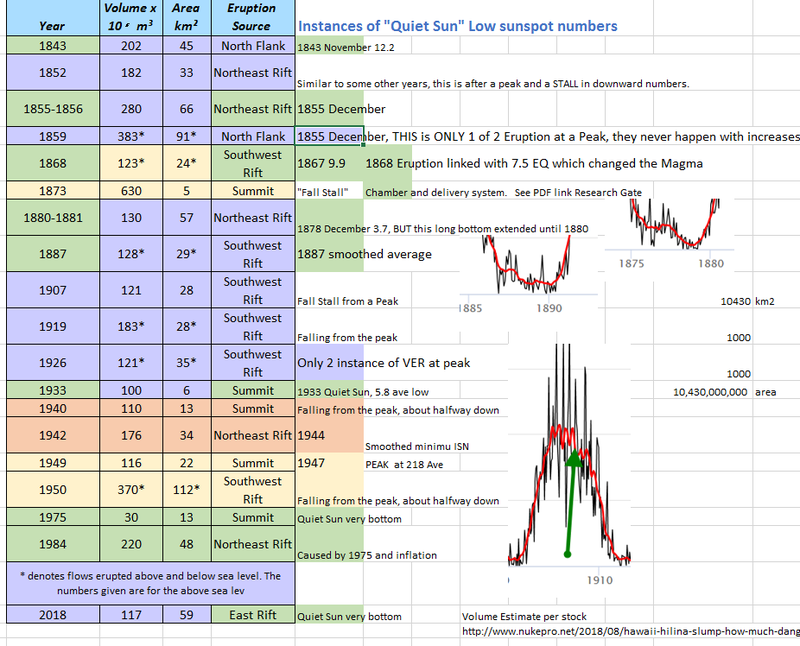 The green highlights in the chart below shows when eruptions and Quiet Sun (QS) are perfectly aligned, which is more than half. And using the linked reference below, that real scientist shows by chemical analysis that the 1868 Eruption, linked with a 7.5 EQ, movement of the Hilina Slump, and Tsunami also greatly impacted the Moana Loa Magma system, throwing the QS/EQ/VER link out of kilter for a while. The possible tsunami from Hawaii might be a bigger threat to more people than a volcanic explosion. I made a POLL >>> HERE.